After a gazillion times practicing, he still would get it wrong. Sometimes I thought he was doing it on purpose! He may as well have been. I was clearly being stupid by hammering a method that wasn't working. Could Talking Ben help Number 1 Study for his Test? Ha! You laugh and think he's cute but if you are his mother, you don't think it's so damn cute. Humor is a Catalyst for Memorization? 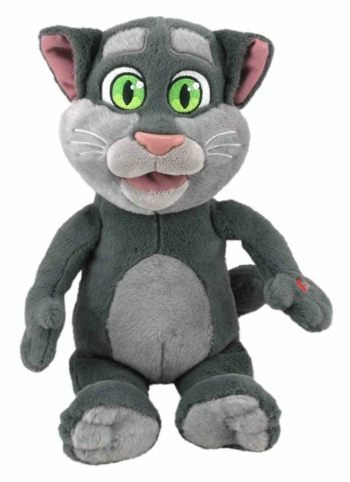 When I saw Cuddle Barn's Talking Tom doll, I got an idea. I thought about humor and the power of teaching oneself and how the two elements might help commit things to memory. Do you remember funny things? I do. I remember silly things too. I think that although we are just talking, your body shakes when you are laughing. You are holding your belly and trying not to pee. So if it was that funny, of course you wouldn't forget, right? See this TED video above on the power of comedy for communication. The same thing goes for reading something to someone, even a Talking Tom. It's not like someone is asking him to repeat something. Rather, he is directing Tom to repeat after him. The child is the teacher now. 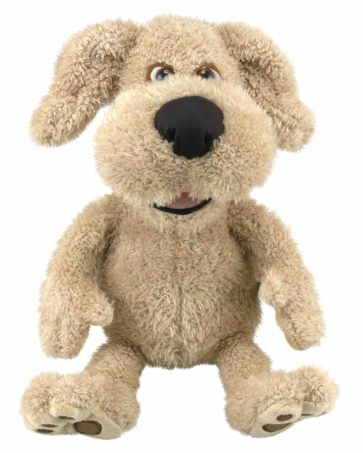 And he must stay even more alert to speak properly and then LISTEN to make sure the words were repeated properly- the Talking Tom style of course. I don't know about you but when I am charged with teaching someone something, I make myself know it. I convince myself of the material as I am explaining it with conviction to someone else. But what do I know, I'm no teacher, so let's go to the real thing. Alison Berkley, Director of the Emerge and See Education Center happily agreed to talk to me about my hunch. Can Talking Tom help my kid study for his vocabulary test? Your Choice: Make Tom repeat fart noises OR turn him into a "verbal flashcard." After she played with the toy, Alison said that sometimes being silly can help as she recalled sucking on helium as a kid to make her friends laugh. "But, we can take that silliness and leverage it for learning, just like any good mom or educator would!" Phew. Okay, I'm not crazy for making my kid study with a toy cat. "Talking Ben is a great way to access auditory memory," Alison said (Alison played with Talking Ben). "Just like we have visual learners and tactile learners, there are also people who are auditory learners." Alison feels that Talking Tom is a useable tool for such learners because it plays to their strengths. It plays back to the child in real time thus reinforcing whatever the child says to it. 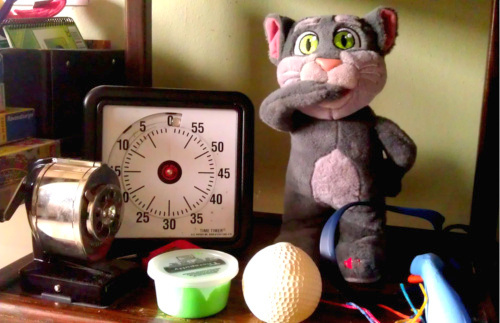 Alison also felt that Talking Tom (or Ben) could be a tool to develop auditory memory in those who may need some extra help. She recalls when she was learning Spanish, she could not parse down the syllables correctly and things sounded like one long jumbled word. With practice, she broke down the sounds to break the overall cacophony into manageable, understandable parts. "I think Talking Ben is in essence doing the same thing," she said. "He is helping kids who might not be able to differentiate sounds or syllables figure out what it is they are hearing or saying"
1. Tell Talking Tom a word and recite definition to him. 2. Stop when Tom talks and try your best to listen to him repeat it back to you. To you, Tom may look out of place next to the our "study buddies" but he is just as capable at helping kids learn. Pictured here is my son's favorite pose of Tom. Alison thought this method could be good for some kids because they are reinforcing a word that they have seen and written (and the visual learners will have drawn a picture) the word and Talking Ben now lets them hear it too. "This multi-pronged approach to studying cements and solidifies learned content in long-term memory so that it can be manipulated and expanded upon." Ooh, I never asked him to write it down while he speaks to Tom. I gotta try that! Thanks Talking Tom. I'm sorry I deleted the original version of you as a APP because my kids got horribly annoying with the poop jokes. And while you have proved to be tremendously useful, I much prefer the version of you that is more soft and huggable even if you take up more space than 47 megabytes. And now here's your chance to win your very own Talking Tom or Ben!!! Just fill out the Rafflecopter form below! Disclosure: Toys are Tools was not compensated by the manufacturer for the publication of this review. A Talking Tom or Ben was provided to tester and expert to facilitate a review. Reviews are never promised. The giveaway prize is offered by the manufacturer. When a friend showed my Talking Tom on her iPad I didn't see past the cuteness to any kind of practical application....Tom remembering my "to do" or grocery list....so I never bothered to download the app.....I may have to rethink this. This is the first i've heard of Talking Tom (plus, I don't have an iphone/pad). I love how cute this is and could find so many uses for it. I have had Talking Tom before. It got annoying and had to get rid of it. This looks much better. But I have a feeling it would work for homework or tests much better than an iphone app would. Right now my child uses me to study for tests. I ask questions and my child has to tell me the answers. We do it over and over until she gets it right. It gets rather tiring. Unfortunately I don't have a phone with apps on it, so I haven't tried talking tom before. My son will be getting a new bike this summer. When writing school admission essays or best essay australia together with Master in Business Administration essays, it's necessary to stay in mind that what you're writing is regarding yourself. Focus then on giving a transparent and definite description of United Nations agency you're, however giving stress to your strengths instead of on your weaknesses.